AllSeated provides wedding reception layout tools for wedding reception table layout design. Create your wedding layout including floorplan and seating all in one place! A wedding reception layout is easily and efficiently created using digital planning tools. Wedding couples and event hosts are using digital tools more than ever before to not only generate wedding reception layout ideas but to keep them organized throughout the planning process. There are many features available within AllSeated to assist with your wedding layout. AllSeated’s state-of-the-art wedding reception layout tool allows you to easily design your floorplan to-scale. The floorplan from your venue can be uploaded into your account to create the wedding layout if it’s not already available within AllSeated. If your venue’s floorplan is not already in AllSeated, you can provide us with a floorplan marked with at least one accurate dimension and our team will scale and upload it into the platform. Using the extensive furniture library, choose from a wide variety of table shapes, styles, and sizes, as well as other various pieces of furniture to create the desired wedding reception table layout. Easily place and move tables and furniture within the wedding layout until you reach the floorplan you like best. Aside from positioning the tables and furniture within the wedding reception table layout, you can customize the spacing between tables, join tables and/or knock off chairs, as well as mark spaces for the dance floor, band, and other features in your floorplan. Remember to include placement for bars, buffet tables, and exits. At any time during the design process of the wedding layout, switch from 2D viewing to 3D to bring your wedding to life! The 3D floorplan viewing options create a virtual walkthrough of the wedding reception table layout allowing you to really see what the wedding layout will look like on the actual day of the wedding. Take the wedding reception table layout a step further by experiencing the layout in virtual reality! 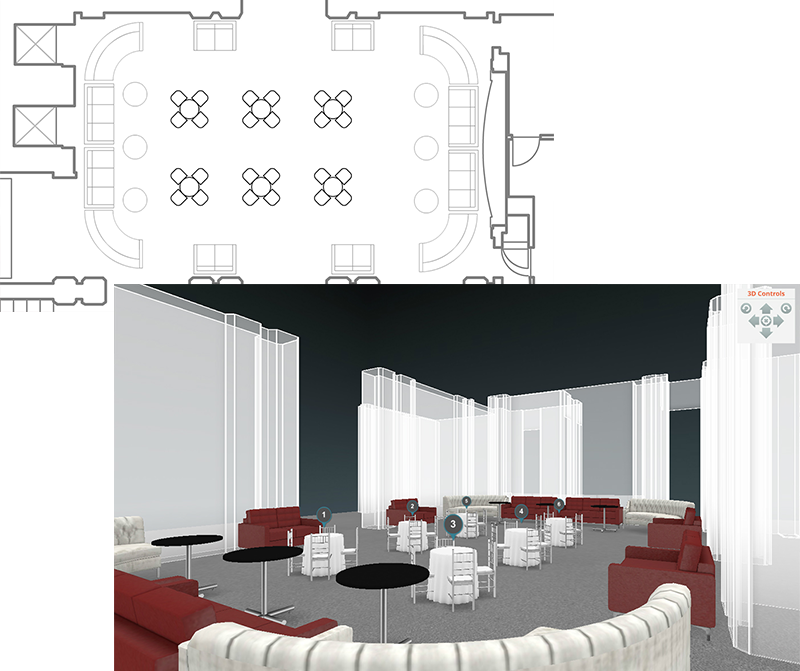 Using AllSeated’s special Virtual Reality goggles, virtually tour the 3D floorplan of the wedding reception layout in a realistic simulation. Learn even more about AllSeated’s Virtual Reality in this video plus the three easy steps for getting started here! While creating your wedding reception layout, utilize AllSeated’s designer tools in order to build table top and buffet displays. The designer tools allow you to see exactly what you can fit to-scale on tabletops which means no more guesswork! Using the designer tools, see exactly what you can fit to-scale on tabletops, which means no more guesswork while planning tabletop layout and decor! The designer tool options currently include place settings, flowers, centerpieces, linens, and buffet pieces, with many more objects to come. Watch this quick video to learn more about AllSeated’s designer tools! The guest list should be established at the start of the planning process. It’s nearly impossible to consider a wedding reception table layout before knowing your guest list! AllSeated’s guest list tool allows you to create and manage your guest list all in one place. Guest information, including names with mailing addresses, can be stored alphabetically or filtered into categories for an even more organization. The guest list gives room for keeping notes, meal type requests, and the ability to track RSVP’s. The guest list also allows for tracking guests and running reports in real time. AllSeated’s guest list links directly to seating. Once you have your wedding reception layout designed, you can easily seat your guests directly from your guest list at the tables in the floorplan of the wedding layout. Easily seat guests within the wedding reception table layout of the floorplan with the option to seat guests at specific seats at specific tables, if desired. You have the option to generate many useful reports. Easily generate a floorplan report which will provide your venue with wedding reception layout set up details. A guest report is useful as it breaks down guest information, including meal type requests and where guests are seating within the wedding layout. AllSeated’s wedding reception layout tool provides for easy collaboration. Invite your entourage into your event for assistance with wedding reception layout design, as well where to seat guests. You can also invite your vendors in to the event to keep everyone operating on the same page and up-to-date on details. AllSeated provides you with the opportunity to create multiple timelines for your wedding. Aside from creating a day-of wedding timeline to manage appointments such as hair, makeup, and photography, you can also create a vendor timeline which lists the setup times and details for every vendor involved in your event. These details will assist your vendor team in further understanding your wedding reception layout. Timelines can be viewed side by side to provide the highest level of organization. Showcase your venue in AllSeated's life-like, immersive, virtual reality technology which truly brings your property to life. Our VR uses 360 diagramming and is a genuine virtual reality tool that is able to bring venues the biggest ROI in the history of event technology! The first to be seen in our industry for professionals. Give your clients a gift they will never forget! AllSeated now offers the experience of creating a Virtual Reality (VR) “look around” of a 3D designed floorplan. The VR offer will include a pair of goggles that hold a mobile phone so that you can view your floorplans anywhere and anytime. Download the AllSeated mobile app now: iOS or Android. 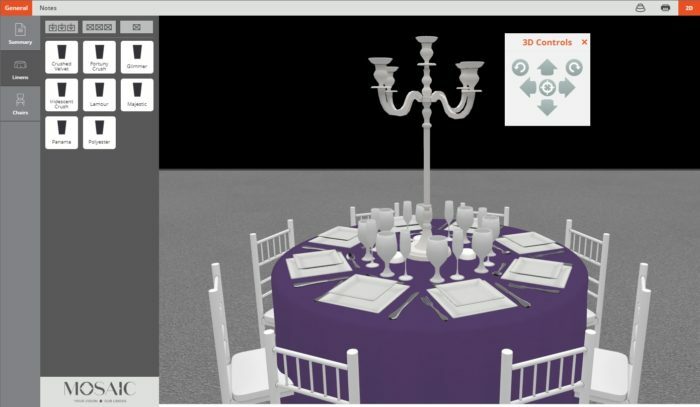 AllSeated’s 3D Designer Tool is a Scaled Table & Buffet Builder. It shows you exactly what can fit on a tabletop, so there is no more guesswork around how the tabletop layout will look on the day of your event. Choose from a library of items including tableware, silverware, glassware, buffet pieces, center pieces, and linens.